It's been zucchini season and we've been swimming in them. With the last minute warm weather in September, the tiny little fruits exploded into footballs overnight. 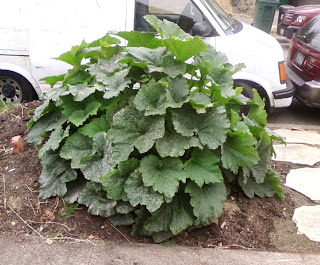 If you recall, this is the retaliatory zucc that I planted in the parking strip during our permit hassle. Roland attributes it's current size and the subsequent bumper crop to all the cow pucky we got from SDOT. People who walk by it stop and stare. Between the giant zucchini plant and the giant sunflower, our yard has become the neighborhood botanical freak show. I looked up the record for the largest zucchini grown and the world record squash was grown by renown giant veg. grower, Bernard Lavery from England. It weighed in at 65 pounds. In moments of delusion, I like to think that I might have been able to at least match that record if I left all but that one squash on the plant and let it go nuts. Like the giant pumpkins it was probably inedible, but if it happened to be usable, it must have supplied a 5 gallon bucket of gratings. By the way, Mr. Lavery is the author of "How to Grow Giant Vegetables." Dispersing zucchini can be tricky. Neighbors and friends either love it or run at the first sight of you walking towards them with the large green appendage shaped objects in your arms. Luckily, we've been promised ample supplies of zucchini bread from grateful recipients, and I look forward to it. I haven't had much time to bake myself, so having someone else do it and share is fine by me. At some point, you'll run out of people to disperse it to. I still have a shelf full of the prolific fruit in the fridge, so I'll either have to grate it and store it in the freezer, make copius amounts of soup or resort to covert, guerrilla operations. 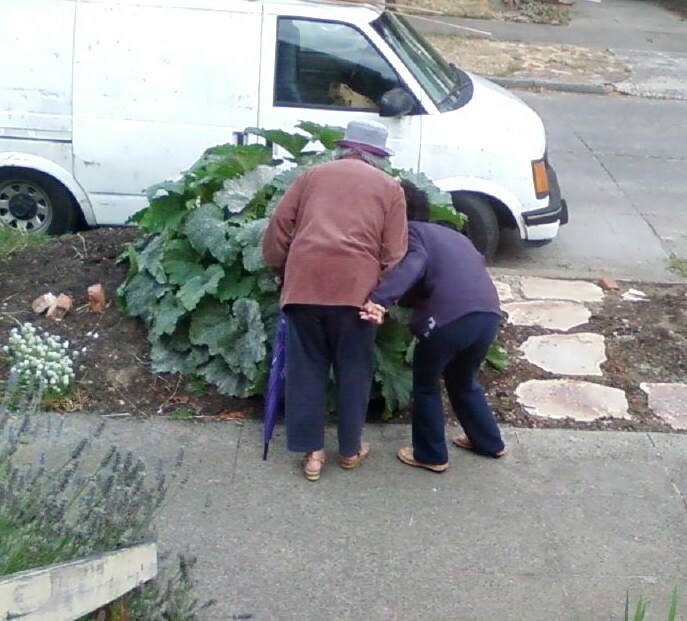 Now putting zucchini's on the doorsteps of unsuspecting neighbors is rather tricky. It's important to avoid any neighbor on your block or even the next several blocks in a radius around your garden, because they'll probably know you're the source. So, here's how to do it. When walking the dog at night (an excuse to be out late), descretely disperse the zucc's on easily accessed front porches outside the designated radius zone. Think of it sort of like a stork delivering bundles of joy. At least zucchinis don't cry. There is the chance that the squash will get tossed into the compost or garbage. People may even mistake it for a bomb at first. You wouldn't want to be responsible for causing undue concern and authoritarian excess. Best to attach an anonymous note with each delivery. Chances are good that it wouldn't go under handwriting analysis. But, hopefully you live in a progressive, gardener infested non-paranoid neighborhood where folk understand how these things work and out of guilt, can't bare to waste perfectly good food. 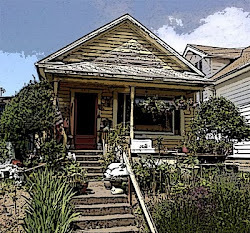 Of course, the zucchini could turn into a summer version of fruitcake and in a karmic sense, end up back on your front porch at some point, looking a little shop worn.